Cartier 's sales continue to grow. According to an article recently published by The Wall Street Journal. The history of Cartier has always been linked to royalty and a very select clientele lover jewelry and exclusive watches. A wide range of brands acquired characterize this company steeped in history and tradition that was founded by François -Louis Cartier in the year 1,898. Cartier can boast of having made the first men’s bracelet watch history, sold in 1911 and now for the first time its target is women, a segment that accounts for 35 % of sales now. With designs so far based on nature (flora and fauna) and their heads so famous Panthere, Cartier now surprises us with a collection of high-end watches inspired by astrology. In a constantly evolving brand, but staying true to a classic style and a marked individuality, presenting the new watch, the Cartier Ballon Blanc evokes a comet by the analogy of the box with the star. 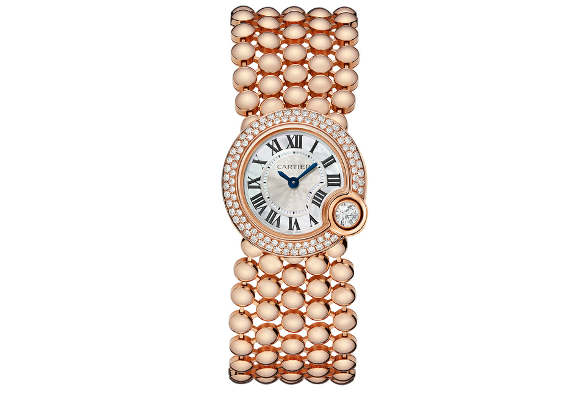 The Ballon Blanc weaves secrets jewelers and watchmakers of the Maison, assumes a pose and invents as jewelery watch. The box still has the air of a pebble as a compact, flinqué mother of pearl dial, blue sword-shaped hands and Roman numerals that interrupt your tour at 4 hours after a sensational diamond solitaire and determined. The bracelet composed of five rows of perfect bubbles, or smooth Pavé try to remind the stars above. Cartier ‘s sales continue to grow. According to an article recently published by The Wall Street Journal, in the past five years the price of a gold bracelet by Cartier it costs 48% more than in 2009. New designs, tradition and quality are the keys to success of this legendary Maison. 159 queries in 0,213 seconds.